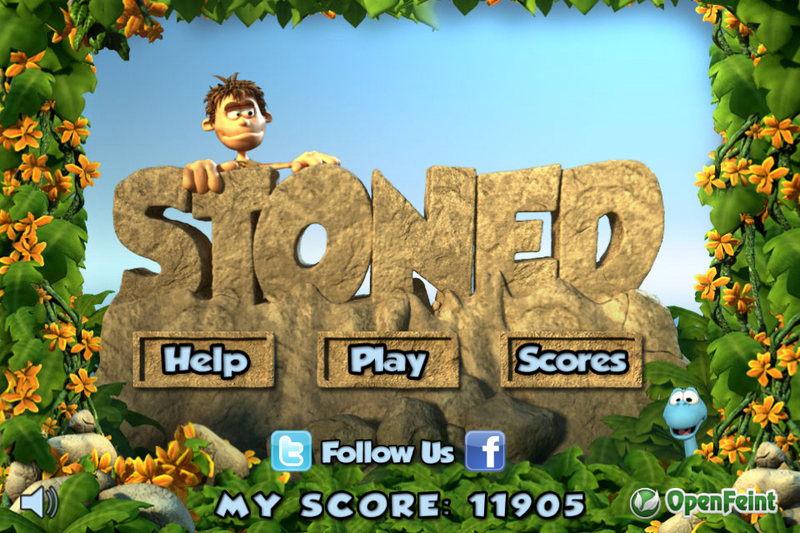 3Dgrafix’s first IOS title Stoned 3D is a shape match game that requires speed and accuracy on the player’s behalf. The gist of it is to match the falling stones with the correct shape on the board. A simple game however does Stoned 3D catch those stones or does it completely miss? The game basically consists of you catching different shaped stones being thrown from the workers above and making sure they end up in the right shaped hole. 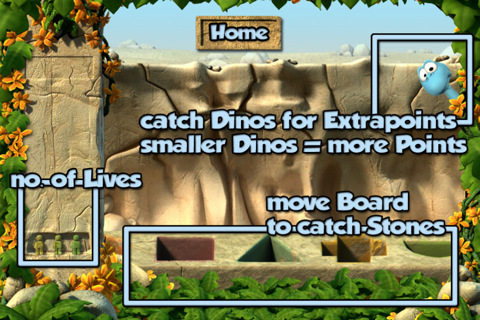 This happens by controlling the board at the bottom by sliding your finger left and right across the screen. A simple mechanic by today’s standard of IOS games however the movement of the board is completely smooth and never jitters. 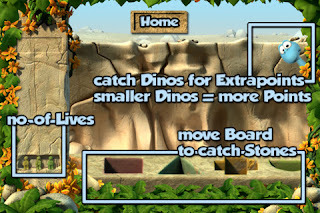 The only way to gain points is to match up the rocks with the right hole and tap the small dinosaur that sometimes appears on the screen, but watch out because for every stone you miss, you lose a life. Three misses and its game over, you’re given your final score and the chance to let your friends know how well you did on Facebook or tweet it to your followers on Twitter. Gotta catch em all!! I mean the rocks yeah? 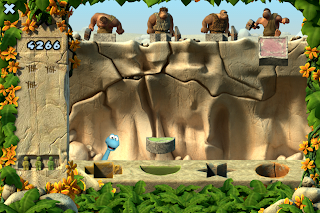 Stoned 3D becomes more difficult, through the rocks falling quicker which makes the game more challenging as you go along, however there is only one level in the game and that can sometimes make things become a little boring. The game gives the look of the Wallace and Gromit type of graphics but the difference is with this, is that Stoned 3D was done in 3D. Textures are sharp and stand out really well however there’s not much of a variety in terms of what you can actually look at since the game does focus on only one screen. Level design is clean and easy on the eyes. Even though you do have you have to use your finger for the slide function on the board, it doesn’t obstruct any of the other gameplay elements. The downside is that there isn’t a variety of levels which could play on. This would have really given Stoned 3D a big boost. 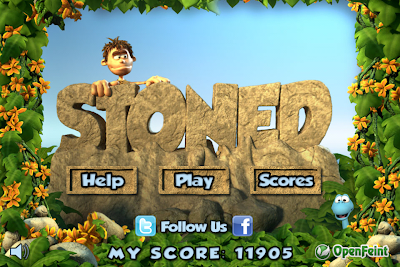 Stoned 3D is a fun, fast paced game which requires quick reflexes and thinking skills in order to gain that high score. 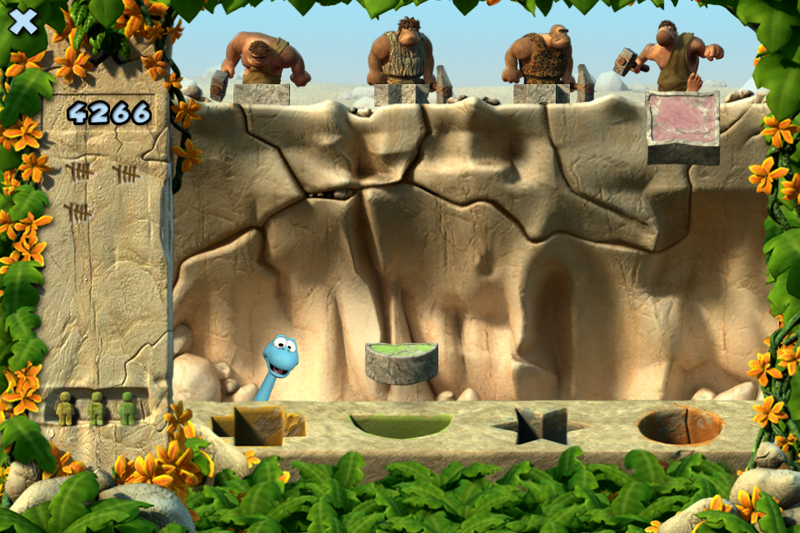 The game’s good use of a clean level design makes the graphics look good but also works for the overall gameplay elements on screen. There are no other levels which is sad because a change of environment could have offered the game new mechanics it could have used. I like the simple style of this game. If you need a break play Stoned. But at the end it's going to be stressfull. I dont understand how it can make things stressful. However you're right, its better that it was simple then over complicated.